Fuel It Up Honda B-series fuel rails are precision cut from 6061 T6 aluminum and feature AN 8 inlet and outlet female threads. If your looking to upgrade your fuel system for your honda b-series motor then this will complement your fuel system. *Has mounting area for those who still want to use the stock fuel pressure regulator. Comes with 1/8"npt plug for those who want to use after market fpr. *Has AN 8 O-ring boss female ports for increased fuel flow(inlet & outlet). *Available in anodized black and chrome. *Comes with inlet and outlet fittings, no searching around for which adapters you need. Please choose which size inlet and outlet fittings you need. Note. If you are using the stock fuel pressure regulator or any fuel pressure regulator that mounts to the fuel rail in the stock location, such as an AEM fpr. Please choose (Using stock fpr). The stock banjo fuel line will not work with this fuel rail. 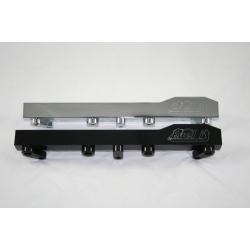 If you need a line to go from the stock fuel filter to the Fuel It Up fuel rail. Then you will need to purchase our Stock Fuel Filter to Fuel Rail Kit.